Congratulations & Happy Retirement, Dr. Vice! 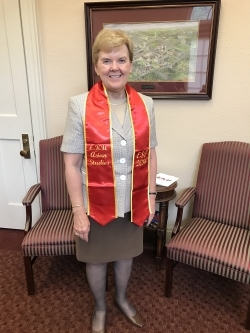 The first recipient of an **Honorary** Minor in Asian Studies at Eastern Kentucky University: Dr. Janna Vice, Senior Vice President for Academics & Provost of EKU (July 2009-June 2017)—here wearing an EKU Asian Studies graduation stole on her last day of work. We thank Dr. Vice for her extraordinary 41-year service to EKU (1976-2017) and for her tremendous support of EKU Asian Studies. From the very beginning, her enthusiastic support of our interdisciplinary program has been utterly critical. Congratulations & Happy Retirement, Dr. Vice! Whatever you do, or refrain from doing, we hope you’ll enjoy every moment of it. Many thanks again and all the best!